For many children with neurodiversities, being told to "calm down" can intensify an already overwhelmed physiological state, especially if they don’t know how to calm. In this post I’ve included three actionable cues for you to try out with your kiddos. I hope you are all able to find some value in them. One of the best ways to learn how to regulate emotions is to interrupt them. Breath is a great tool to not only interrupt a response, but to create space between the time a trigger is experienced, and the time of the response to that trigger. The cue, "Find your breath" is a perfect interruption tool. It's simple, actionable, a bit odd because it's not a common request, and requires focus. For this cue, simply ask your kids to find their breath. Once they’ve found it, ask them to slow down their breathing by making each breath longer. Sometimes closing eyes and placing a light object on your children’s belly can support them in finding their breath. It's best to cue this prior to your children experiencing a big emotion or "spiraling," but sometimes that's not possible. If this is the case and they are too worked up to be touched or for multiple instructions, that’s ok. Stick to cueing them to find their breath in a calm, gentle voice. Cue 2: “Use Your Breath.” Or, "Let Me See you Breathe." When we calm the breath, we calm the mind, and our whole system follows. One effective breathing technique is to slowly breathe in through the nose and out through the mouth. If your children can, ask them to, "fill your belly with air" on the inhale (expanding the stomach) and release the air in the lungs by pushing their stomach in. This is also called Diaphragmatic Breath and has many research-backed benefits. Placing a light object on the belly can visually assist your children in seeing their breathing. Crocodile pose is a powerful pose to calm the nervous system. To get into this pose, ask your children to lie on their belly, stack their hands, and rest one ear down. 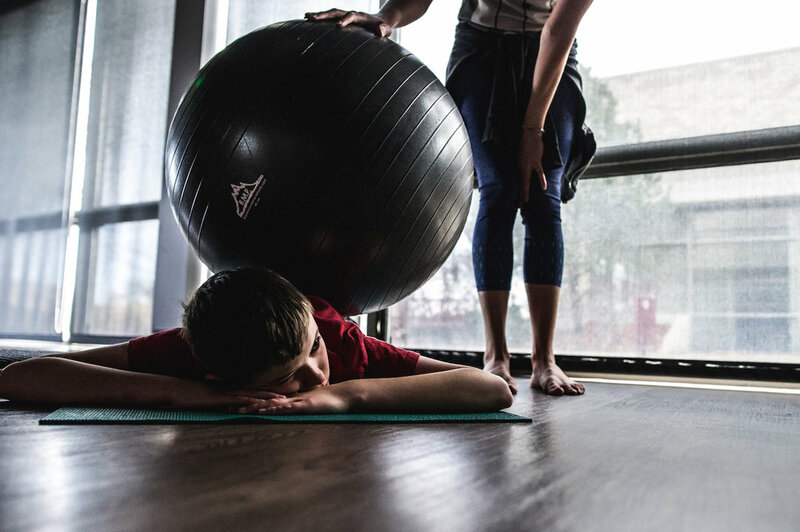 Placing something on your children’s back for some pressure can be calming; but, make sure to not place anything heavy that impedes breathing at all. Sometimes getting into the pose with them, or even before them, is helpful and encouraging. It lets children know they are supported and have a teammate during this challenging time; and, it can help you calm as well. It’s best to try one technique at a time, instead of all at once. Because every child is different, even minute-to-minute, this is all trial and error. Find what works best for your kiddos, in certain situations, and for differing emotional intensities. For more information and techniques, try out a Spectrum Yoga® class (first class is free!). Blog Post By: Christine Devereaux, Founder and Creator of Spectrum Yoga®.